Dr. Graham’s Homes School Choir is arguably y one of India’s most renowned and accomplished choir’s, that has built itself over the years. The choir has always been an integral part of Dr. Graham’s Homes and it was only after one of the school’s inter-cottage singing competitions a few years ago, that the idea of showcasing the children in concert at Kolkata was conceived. Since then, the children travel to Kolkata in December every year to perform and raise funds for their school. Today the “Children’s City in Concert” has become a much looked forward to event in the social and cultural calendar of Kolkata. The children from the choir come from a variety of backgrounds and ages range from five to eighteen years. They have become worthy ambassadors of Dr Graham’s Homes. In 2007 the choir toured the United Kingdom and performed at venues from the South of England to the north of Scotland. They received rave reviews wherever they performed and spread enormous goodwill for the Homes in this part of the world. 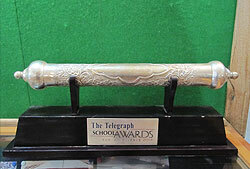 The Telegraph Schools Award for Outstanding Extra Curricular Achievement by a School. The choir also had a very successful tour of the United Kingdom in 2007, where they sang before played and appreciative audiences at St Paul’s Church, also known as the Actors’ Church in Convent Garden in their first concert on foreign soil. They performed at a total of 13 venues both in England and Scotland. The Choir sang live over B.B.C. in 2007, which was a unique opportunity and platform to showcase their outstanding talent. 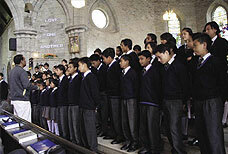 The Choir toured New Delhi in the year 2004 and performed at the ITC Maurya, the British High Commission of India, the Y.M.C.A. International, St Columbus School and Sacred Heart Cathedral. Such have been the achievements of the children of the Homes that it is befitting to conclude by singing in chorus ‘The Hills are alive with the Sound of Music”.